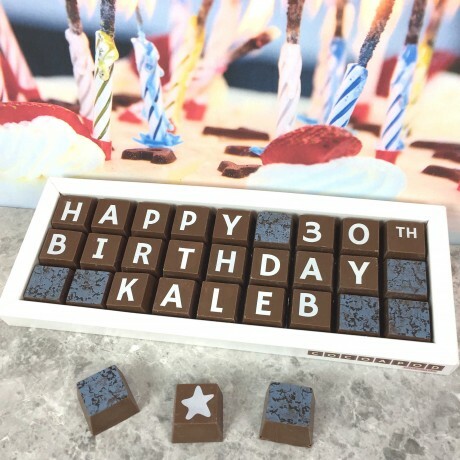 Create your own happy 30th birthday name message in solid blocks of delicious Belgian couverture chocolate. Add you own name and number in different flavours and patterns. Not a 30th birthday? Then add any number you like! 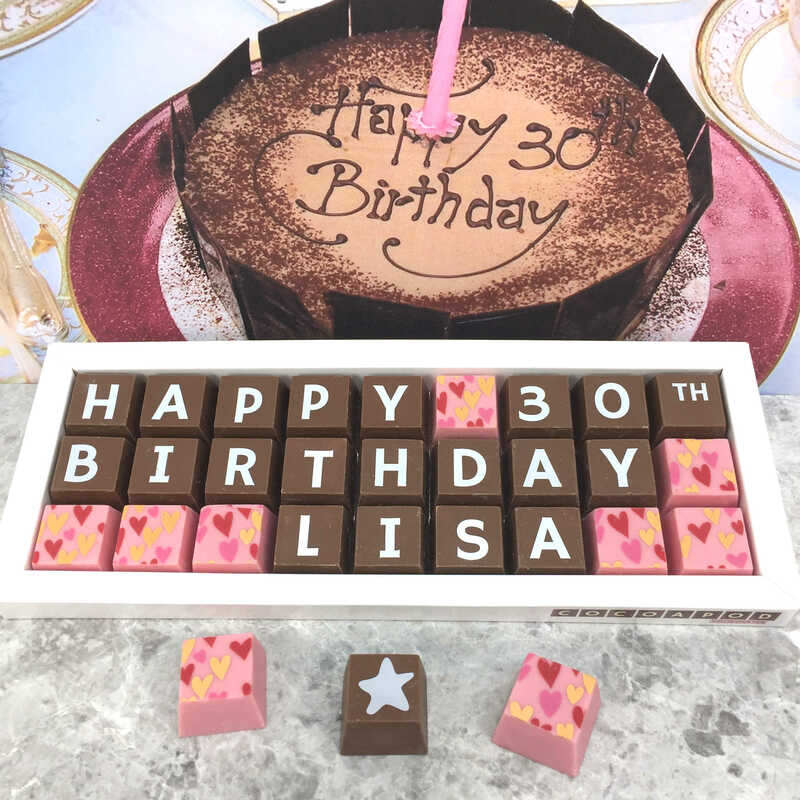 Why not surprise the birthday boy or girl with their name in chocolate for that special 30th birthday? Handmade by Cocoapod in a choice of dark or milk Belgian chocolate with white letters on the top of the chocolate. Our chocolate supports cocoa farmers and sustainable cocoa cultivation. 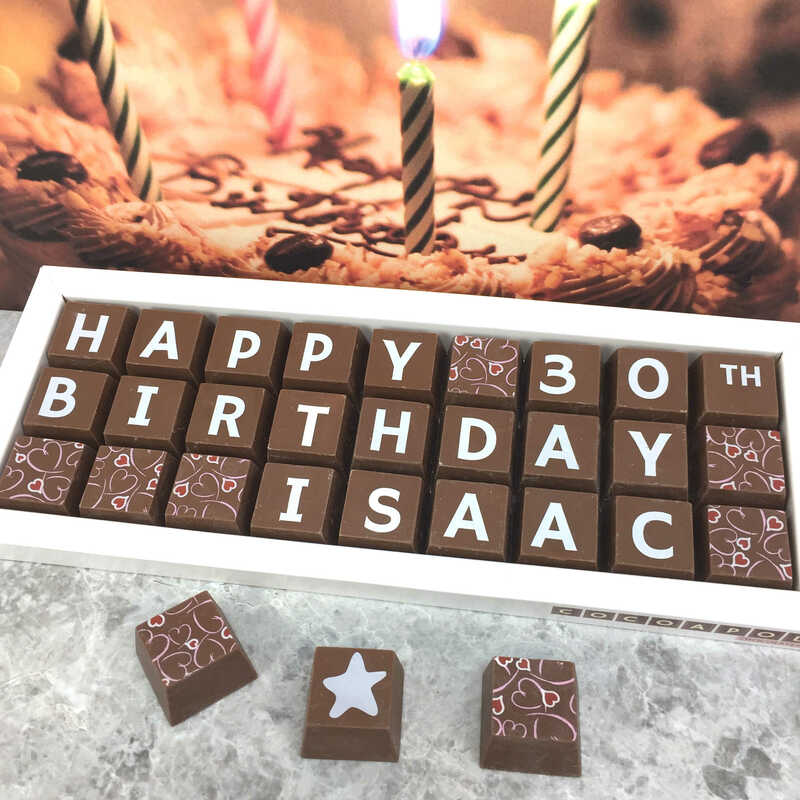 COCOAPOD is the original UK maker of solid block chocolates with messages. The QUIRKY font has a mix of upper- and lowercase letters, the a, e, i, m, and n are all lower case and the rest are upper or indeterminate case.The CLASSIC font is all uppercase letters. 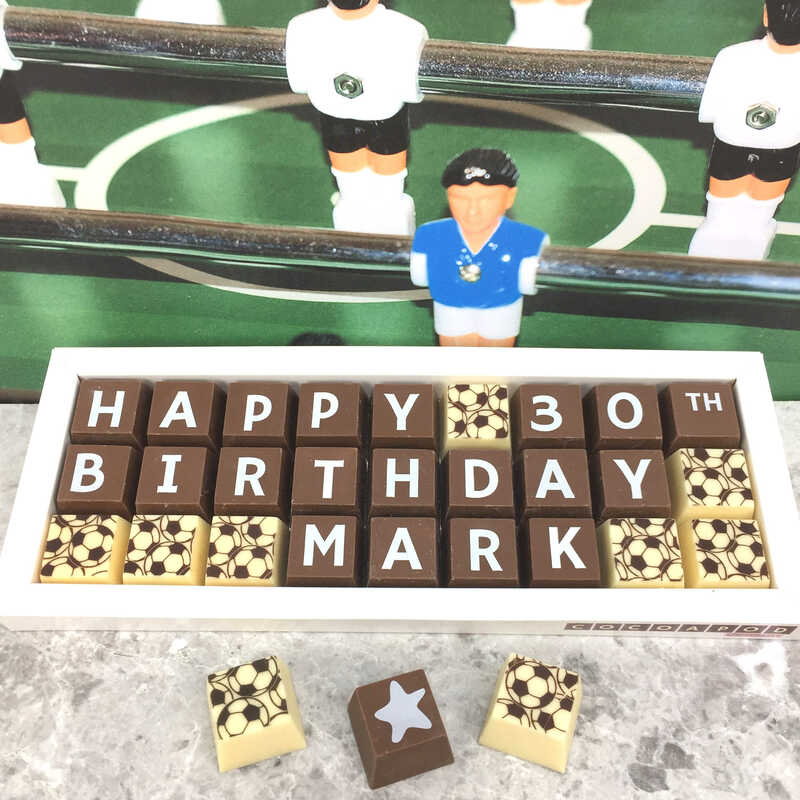 The box is 245 x 96mm and weighs net 250g and contains 27 chocolates. Please note any extra decorative blocks in the photo are not included. Dark Chocolate ingredients: cocoa mass, sugar, cocoa butter, emulsifier: SOYA lecithin; natural vanilla. Dark chocolate min. cocoa solids 53%. 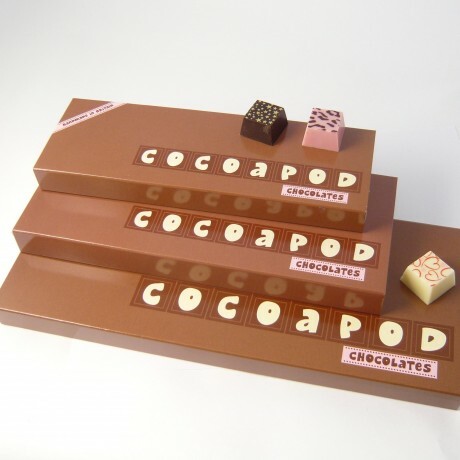 Milk Chocolate ingredients: sugar, cocoa butter, whole MILK powder, cocoa mass, emulsifier: SOYA lecithin, natural vanilla. Milk chocolate min. cocoa solids 33% & min. milk solids 21%. White Chocolate ingredients: sugar, cocoa butter, whole MILK powder, emulsifier: SOYA lecithin; natural vanilla. White chocolate min. cocoa solids 28% & min. milk solids 23%. Strawberry flavour ingredients: sugar, cocoa butter 30%, whole MILK powder, emulsifier: SOYA lecithin, flavour, colour: cochineal (E120), natural vanilla. Orange flavour ingredients: sugar, cocoa butter 29%, whole MILK powder, emulsifier: SOYA lecithin; natural flavour, colour: E160e, natural vanilla. All allergens are in CAPITALS. May also contain traces of nuts. Dark chocolate contains no MILK but cannot be guaranteed to be MILK free. Contains no wheat, gluten, gelatine, eggs or alcohol. Some vegetarians may not consume (cochineal) E120 which is in the strawberry chocolate and some of the transfers as a red colouring. 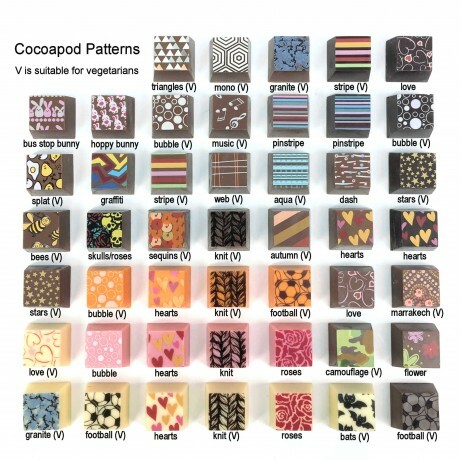 Patterns marked with (V) are suitable for vegetarians. Super fast service - 2 deliveries in time for Mother's Day when I'd left it right to the last minute! Amazing service and nana and granny were both really pleased with their gift! The most important thing the quality and taste was fantastic myself and all the guests were blown over. Lovely item. Ideal for Valentine's Day. Lovely gift, arrived well packaged and in good condition and made the recipient smile! Many thanks! Great presents but if i'm honest the packaging is very corporate not very celebratory! She was over the moon and chuffed to bits when she opened it. I didnt expect it come too fast as the delivery was superb! I ordered these for my brother in law and his wife, I must say these chocolates are so beautifuly made and I know they will love them as much as I do. I will deffo be ordering again! Thank you. I bought two of these for my Niece and Nephew as an Easter gift and they both loved them! They thought the design was cute and the chocolate was, in their words, "extra yummy". Chocolate with colour, texture and personality. Fun and deliciously good tasting too.